We are pleased to announce the addition of Tidal Fit to our swim spa range. These will suppliment our existing Jacuzzi SwimLife models and means we can offer you an even wider choice, starting from £14,995. Visit our hot tubs website for more information. 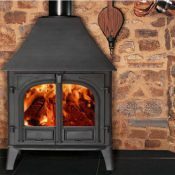 As we live in an age where there is a cleaning product “specifically designed” for virtually every kind of dirt you can imagine, you may be tempted to start searching for a woodburning stove glass door cleaner or something like that. But I have good news for you. Very good news, in fact. The truth is you can clean the glass on your stove door using nothing but wet newspaper and a bit of ash from the bottom of the stove. All you need to do is get a couple of sheets of newspaper, scrunch them up and wet them under the tap. Take one of the pieces of newspaper and dip into the ash from the stove and wipe it over the glass on the inside of the stove door. At this point you should see the brown deposits beginning to shift. Once your piece of newspaper is so black you can’t use it anymore, take the clean piece of wet newspaper and use it to wipe over the glass. At this point you can either repeat the process if some but not all of the dirt has been removed or, if the glass is clean, simply wipe it over with a piece of kitchen towel to remove any smears. And that’s it. A nice, clean piece of glass on your woodburning stove. It takes about 3 minutes to do, costs you absolutely nothing and leaves the glass lovely and clean, ready for the day when the evenings start to feel chilly once again. Would you buy a car without suspension, no of course not? Well now, thanks to the Simplicity Conquest, you can also have suspension on your Garden Tractor. 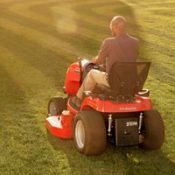 We all know that suspension on a vehicle makes it more comfortable and the new Simplicity Conquest brings a whole new level of comfort to mowing times. The SCS-4 suspension system on the Simplicity Conquest makes mowing at speed so much more comfortable than on a conventional machine. Click here for more details. 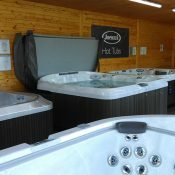 Our new Jacuzzi® hot tub showroom is now open at the Wyevale Garden Centre, Thornbury, near Bristol where we have 8 Jacuzzi® hot tubs on show. 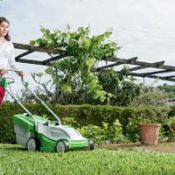 NEW: VIKING ME 235 electric mower – Even small lawns require immaculate care. The VIKING ME 235 electric mower is easy to operate and reliable. With an excellent price/performance ratio, this mower impresses on lawns up to around 300 square metres. Even small lawns require immaculate care. The VIKING ME 235 electric mower is easy to operate and reliable. With an excellent price/performance ratio, this mower impresses on lawns up to around 300 square metres.